The “Blog” of “Unnecessary” Quotation Marks: big "inconvenience"
You can tell this pizza place is totally "sincere" in their "apology." Thanks, Peter. Holy "crap." This sign should win the "title" for the most "unnecessary quotation marks" in such a "small" space. Talk about "distracting." 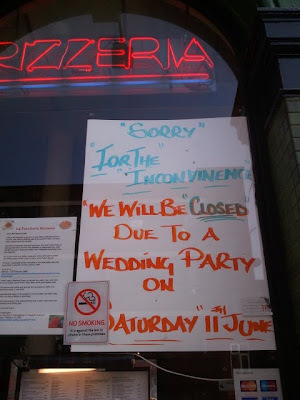 It's a shame they can't spell the word inconvenience either!